The Oilers are Red Wing killers in playoffs. Especially with Conklin in net. CGY vs the Jackets would be a really good series, we've made fun of Hitchcock teams and Falmes teams in the past for being boring, but that's not the case now. I'd like CBJ's chances as well. I wouldn't at all want to face CBJ in the first round. Kent: Your worries about Columbus are well-founded. Veteran, well-coached squad with a very good young goaltender. 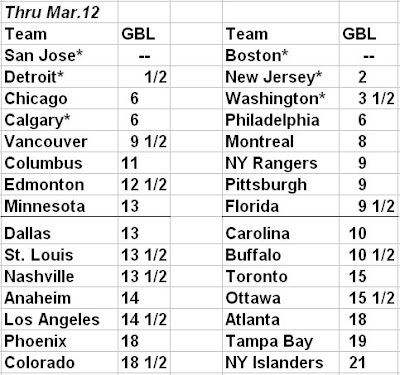 If they drew the Flames, I'd look long and hard at the Vegas odds on Columbus, because that screams upset special. I'd like their chances against any of the top four right now, to be completely honest. Can I get a "Kiprusoff! Kiprusoff! ", anyone?